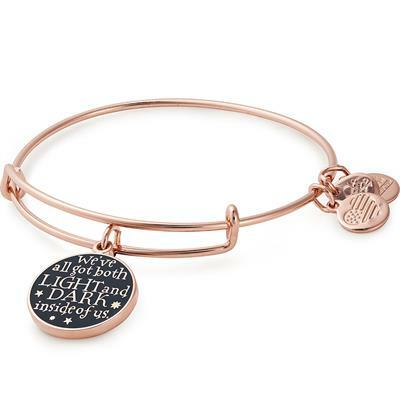 This rose gold Alex and Ani bangle is the perfect gift for any Harry Potter fan. It features a double sided charm, with one side saying 'We've all got both light and dark inside of us' and the other saying 'What matters is the part we choose to act on'. Wear this quote as a reminder to stay true to yourself and what you believe is right, no matter what else is happening around you. Pair this bangle with others from the Alex and Ani Harry Potter collection for the ultimate stack!